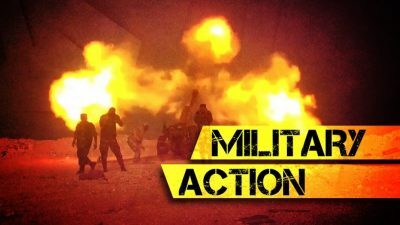 The Syrian Arab Army (SAA) and its allied local militias have kicked off an advance on ISIS positions in the eastern part of al-Suwayda province. It’s interesting to note that some former units of the Free Syrian Army (FSA), which has reconciled with Damascus, are participating in the advance. The SAA artillery and the Syrian Air Force carried out about 50 strikes on ISIS targets in the areas of al-Waer, Ard al-Karaa, Mazrea al-Hhatib, Sneim al-Ghirz and east of Dabatheh, Rabbet al-Hisn and Tel Razin. The Syrian media says that ISIS suffered heavy casualties in these strikes, but no photos or videos to confirm these claims were released. The goal of the ongoing operation is get rid of ISIS cells hiding in the desert. In July, these cells carried a series of sensitive attacks in the government-controlled areas thus triggering the decision to deal with them as soon as possible. In early August, Hayat Tahrir al-Sham (formerly Jabhat al-Nusra, the Syrian branch of al-Qaeda) and Jabhat al-Wataniya lil-Tahrir, an alliance of militant groups created with Turkish assistance, started a wide-scale effort to crack down on supporters of reconciliation with the Damascus government in the province of Idlib. According to local sources, militant groups have already arrested at least 60 civilians and local figures who support a deal with Damascus to put an end to hostilities. These developments are an obvious attempt by militant groups to undermine a possible peace process in the Idlib de-esclation zone. According to some sources, Turkey, which is one of the guarantor states of the de-escalation zones deal reached in Astana, has behind the scenes been encouraging militants in their effort. Recently, the US-backed Syrian Democratic Forces (SDF) declared that they had established full control of the Syrian-Iraqi border on the eastern bank of the Euphrates defeating ISIS terrorists there. However, the SDF security situation is still ongoing in the area because a notable amount of ISIS cells are still in operation there.